Charlie-Helen Robinson had the vision – lets have a wine dinner with a group of people from Adelaide coming to a venue in McLaren Vale to celebrate the knowledge and experience that our grandparents have and what this role means to on-coming generations. In particular in the McLaren Vale wine scene and what role this older generation means to today’s wine industry. 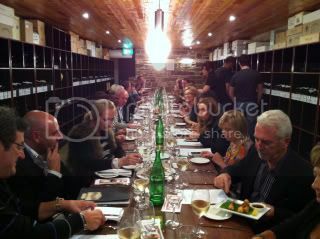 Within what seemed like a short period of time the big day was upon us and the Cellar at The Victory Hotel was descended upon by a 30 strong group of keen and enthusiastic people from diverse backgrounds all brought together by Charlie. Great job Charlie! The venue was well set up and when the bus arrived it was all go. The first course soon arrived. The chicken and seafood was matched well with a 2008 Karra Yerta Eden Valley Riesling, that was full of limes – particularly lime zesty. The second course of rabbit pie came with a 2010 Kay Brothers Mataro. 2010 was an excellent vintage and this wine was no exception with flavours of cherry and plum with hints of violets and a meatiness that I tend to find with this variety. The tannins were a little grainy but this is part of what Mataro is usually about. Without letting Colin Kay, the current head of Kay Brothers, finish his rabbit pie he was standing up and sharing with us some of the rich history of the Mataro grape in Australia plus the even richer history of the Kay family in McLaren Vale. We were all delighted with his stories and also delighted that Colin was willing to share with us copies of his family daily records from the late 1890’s. These documents had me convinced on how well their fortified sales were back then – only to be told that Tawny was the name of one of the family cows and the volume mentioned was not the volume of Tawny “Port” sold but how much milk Tawny (the cow) produced daily. The third course was for me a steak and I enjoyed the Rudderless 2006 Grenache which is made from the vines surrounding the hotel. As a fan of McLaren Vale Grenache I was looking forward to and was not disappointed. The perfumed red fruits combined with fruit strength and mid weight tannins was just what we were looking for. A wine options game with 2 wines was an interesting venture during the night. Each person was given their own stash a fake Deadred Dollars and were able to bet on 1 of 3 options for the category of what vintage did the wine come from, what grape variety the wine was made from and lastly what winery the wine came from. There were 2 wines that were covered to ensure nobody could cheat. The wines ended up being a Zinfandel from the Inkwell stable from 2009 and 2010. These wines are so different and so it was interesting to see the reaction when people were told the 2 wines came from the same winery, same vineyard and same winemaker. The Vintage Cheddar with dried muscatels, quince paste and crackers went down a treat mixed with the Graham Stevens Wines 2010 Vintage Shiraz. This wine is just essence of Shiraz mixed with clean spirit. It is interesting that the Vintage fortified style is not a big seller however almost all in the room were delighted with the finishing wine of the night. A big thanks to all that attended that made the night something to remember but special mention must be made for Colin Kay for the generous giving of his time and experiences, for Ron who was the bus driver and had to sit and watch most of us indulge in good wines and to Charlie for bringing the night together. 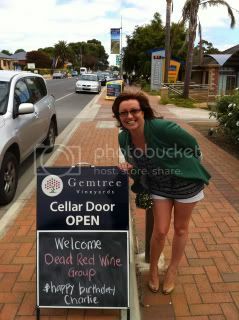 The DeadRed Wine Group through it’s founder, Charlie-Helen Robinson, conducted a wine tour to our beloved McLaren Vale. The tour was titled – Capricorn. This elaborate method to celebrate ones birthday is a sensational idea and it turned out to be a sensational way to spend the most part of the day. 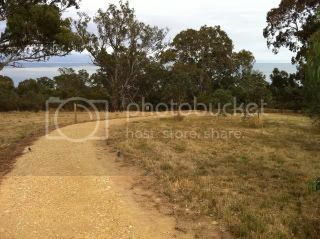 A bus ride to and from McLaren Vale with time spent at 3 wineries with a lunch at one of them. 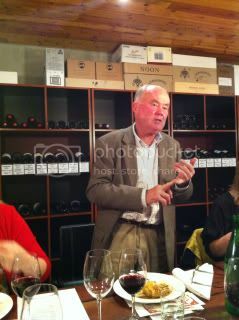 The wineries were Gemtree, Settlement (with a wonderful Pizza lunch) and Graham Stevens Wines. The day was full of wonderful things, wonderful wines, wonderful winery hosts, wonderful Pizza’s, wonderful people. All coupled with the wonderful Mediterranean weather and the best place on the wonderful earth called McLaren Vale. To complete the wonderful items, I had the pleasure of joining the group here in McLaren Vale. 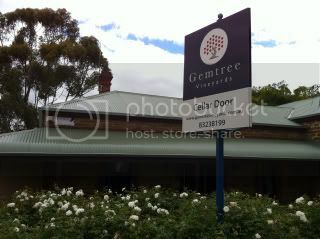 The first stop was Gemtree Vineyards, who have a cellar door outlet in the Main Street of McLaren Vale. Gemtree are a family owned business who have made a very conscience effort towards true sustainability. They are a certified organic producer – this is in it’s self a commitment of effort and financial. They are also using biodynamic techniques in some of their vineyards. Biodynamics is finding a niche in McLaren Vale with results that are not only shown in the vineyard but also the resultant wines as well. In the commitment to sustainability includes aa long term testing regime of different wine varieties – varieties that produce the right acid, sugar and flavor balance with significantly less water than the mainstream varieties. All this while still producing excellent wines that the wine drinking public will drink. As with any change this change requires considerable effort or energy from the company. Gemtree’s commitment to sustainability is unwavering and can be seen in their whole philosophy. This family enterprise has also dedicated a section of one of their properties to a publicly open wetlands walking trail (complete with information and BBQ facilities) with planting of indigenous plant species that is attracting animal life of all kinds. Thee cellar door has a lovely wooden table top that has “Gems” on it – which is a nice touch. We tried 4 wines from their range – 2 showing their commitment to new varieties. Quite strong aromas of stone fruit, lemon zest and melons.. The flavors showed good acid (with lemon and limes) with some nashi character. The acid level is not for everybody and some of the tasters indicated they got bitterness in the wine. This 100% natural and biodynamic wine has had nothing added to it – natural acid levels and natural yeasts make this a very natural wine. I consider this a fresh and light wine – to be drunk on it’s own or with delicate seafood. it should be noted this vineyard uses 33% less water than chardonnay requires. Another biodynamic wine from a drought resistant variety from Spain. Spain is a hot climate and the Spanish are not silly so they understand the requirements of their climate and what wines to grow. These vines get about 1 drink per year instead of multiple drinks per month during the summer. Luna Roja means red moon and this wine is red and juicy. It is all about cherries, earthiness and these tannins that are chewy but juicy all at the same time. A medium bodied wine that has significant character that screams to be consumed with duck. This wine is so much better than the 2009 offering. I get layers of dark plum, pepper and cinnamon spice with hints of chocolate and licorice. Yet again some juicy and chewy tannins that will see this full bodied wine well into the next 5 years (if you will let it live that long). A big wine that needs big flavors and I can see a thick T-bone steak in this wines future. Made from 50% Cabernet Franc, 25% Mourvedre and 25% Petit Verdot. The berries from the Cabernet Franc comes through quite strongly on the nose. The 3 wines contribute their own space in the complexity of this wine. The juicy fruit compote of the Franc, the spice and almost meatiness from the Mourvedre plus violets from the Petit Verdot. I particularly liked the tannin structure here that shows the pedigree of the wine. 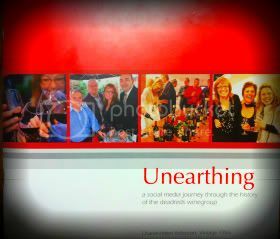 I have just had the pleasure of finishing the book entitled “Unearthing – a social media journey through the history of the Dead Reds wine group”. The pleasure was in the reading not in the finishing. Until quite recently, I have been watching the Dead Reds group and their activities through social media from a distance. As the Lonely Grape blog and now the Taste McLaren Vale web sites have been my musings – with using social media as a way of getting known into that big world out there, I thought this was going to be an interesting read. Interesting it was as the book outlines the use of social media standards of Twitter and Facebook to get conversations going about the group and thus interest being raised in their functions. What i was not expecting was outlining the use of Skype to have a social event compared in Adelaide by somebody in Darwin. Spreading the word about their cause was also conducted by a number of bloggers – the same as I am doing here. The charm of the book really lies in the mastery that is Charlie – Helen Robinson who has the ability to turn all these social media efforts into a number of gatherings where like minded people get together. She shows that just having a Facebook account and a Twitter account with blogs etc, does not mean that people will break down your door to be involved with or purchase your product. No, it is more about the conversations and how you engage people. This simple yet key element makes all the difference – the difference between just another Facebook page, as Charlie says “to have the ability to fill a room”. I take my hat off to Charlie, she has a spark that has taken a social media experiment to a working group of people that not only gets together on a semi regular basis but also raises money for charity. The book is for sale for $35 and message me if you are interested in a copy and I will direct you to Charlie.